The Old Village Gym is a boutique gym in Mt. Pleasant, SC that caters to anyone who wants to improve their physical well being through exercise. We believe that good physical health goes hand in hand with living a good life. Offering 24-hr access, Functional training, Beach workouts, Private and Small Group workouts. Hawaiian native, Rob Short, grew up in Kailua-Kona, home to the famed Iron Man Triathalon and what he calls “an outdoor playground.” He grew up watching the triathletes biking past his house, amazed at their physical endurance, and spent most of his time surfing, spear fishing, climbing the old lava flows and playing football. As an adult, living on the mainland, Rob pursued a career in physical fitness and founded the Old Village Gym in Mt. Pleasant with the goal of creating a fun and exciting atmosphere where he could make a positive impact on people’s lives. 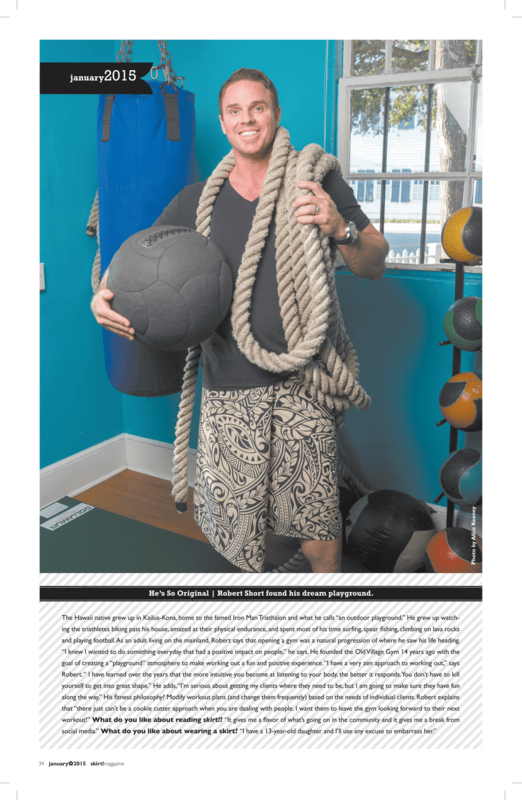 His intuitive approach to training and genuine desire to see his client’s reach their personal best has made for a successful 20 year run in Charleston’s fitness Industry. Rob resides in Mt. Pleasant with his wife, teenage daughter and a menagerie of pets. What has been your greatest fitness challenge since then? Personally, I think it is the same challenge we all face. Finding a balance in life to fit in everything we need to do. Every facet of our lives needs to be nurtured and cultivated in some way, none more than ourselves. We are all busy, but we have to carve out time for our physical and mental well-being. Both are completely interrelated. There is also a whole other set of challenges that are facing the heavily tech dependant younger generation. Devices are replacing physical activity. We need to have the conversation with our kids that “Health is Wealth”. Taking care of your body through exercise is an investment in your future. Why did you choose to bring others on that fitness journey by opening a studio? Opening a gym was such a natural progression of where I saw my life heading. I knew I wanted to do something everyday that had a positive impact on people and the gym became the perfect conduit to making that a reality. What is your fitness goal/daily workout like? First of all, you have to look at your workout the same way you look at brushing your teeth. It has to be part of your daily routine. That being said, I have a very Zen approach to my workouts. The first thing is to be where you are that day – live in the now. I have learned over the years that the more intuitive you become at listening to your body – the better it responds. You don’t have to kill yourself to get into great shape. As far as the ideal workout? It has to incorporate cardiovascular exercise, resistance training and some stretching/flexibility routine. Consistency is the key, but be realistic and give your body a break when it asks for one. What is your goal for those that come into your studio? First and foremost – I want them to leave the gym looking forward to their next workout. If I can get a client back in the door, it doesn’t take long for them to feel like a part of our fitness community here. Being surrounded by people that all want to improve their physical well being is extremely motivating. My job is to make them a part of this family and address their specific goals with a tailored approach that I know will work for them. There just can’t be a cookie cutter approach when you are dealing with people. Yes, I am. But, I pride myself in making sure my clients forget that pretty quickly. We are all on this journey together. I am serious about getting my clients where they need to be, but I am going to make sure they have fun along the way. I can mask a challenging workout behind my laid-back approach. Some of my clients have been coming to me for 20 years and I now train their children. It is so rewarding to see a passion for fitness being passed on to the next generation. There is a certain positive vibe that we have in the gym that clients often comment on. The greatest compliment someone can pay me is that they like the friendly, easygoing atmosphere in the gym. I think it makes people feel comfortable here. Also, there is zero intimidation and pressure in this place. People really walk out of here smiling, which is great! Personally, if I had to put my finger on what my “special touch” is in the industry, I would say it is my ability to help people be the best version of themselves.